Party Ideas by Mardi Gras Outlet: Crawfish Boilin' time! In south Louisiana, the arrival of Lent and the requisite religious sacrifices that entails means no meat on Fridays. Since we live in one of the richest seafood areas in the country, that is not too much of a penance. We "make do" with crawfish pies, fried catfish, oyster poboys and seafood etouffee. We have a special fondness for crawfish (sometimes described as crawdads or mudbugs). A Crawfish boil is a ritual in itself. There is a technique to boiling great crawfish. It is not something you can do in a hurry. It takes lots of purging, boiling, seasoning and soaking to get the perfect batch of crawfish. All these steps lead up to a good time had by all. Crawfish boils are time to get together with friends, slow down while the mudbugs soak and celebrate the good things in life. There is nothing comparable to a crawfish boil on one of those first pretty days of spring. This weekend will be my first Crawfish boil of the season. I can't wait! Just in time for the Crawfish season, MardiGrasOutlet.com has expanded their line of Louisiana products and Crawfish boil supplies. There are fun crawfish hats and crawfish boil beads to wear to the party. They even have some crawfish bibs for those from the "nawth" that need to keep their clothes clean when eating boiled crawfish. For those who are hungry, they offer food mixes so you can make crawfish etouffe, gumbo or even crawfish pie. My favorite new items are the collection of Seafood Buffet tableware by Tika . Since 1991 when Hasslock Studios introduced hand painted platters at the New Orleans Jazz and Heritage Festival, the popularity of these bright colorful serving pieces has continued to grow. Nationwide, Tika's whimsical designs are recognizable. The playful "Tika" Collection called Seafood Buffet serves up a variety of entertaining pieces with assorted seafood like crab, shrimp and crawfish complete with garnishes of lemons, peppers, artichokes and Tabasco sauce. The bright blue, red and yellow colors on the platters pop against the off white background. Some of the pieces have raised three dimensional accents like this large crawfish on this platter. Originally only available in hand thrown pottery, the whimsical pieces are now available in ceramic at very affordable prices. MardiGrasOutlet.com carries a large variety of styles and shapes in this collection, all of which are microwave and dishwasher safe. This makes clean-up after those messy crawfish boils a breeze. Not only are these colorful serving pieces great for crawfish or seafood boils, they also make great gifts and fun accents for any home. The platters would look great hung on the wall or displayed on a easel. 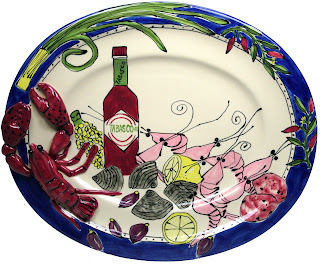 An exclusive item that MardiGrasOutlet.com carries are these cute crawfish bowls. Made with removable glass insert bowls they are perfect for serving your special sauce at a crawfish boil. If you're not interested in the production of a crawfish boil, try a hot crawfish dip. You can get your fix of Louisiana crawfish with this recipe for Crawfish Cardinale. It is one of my favorite hot seafood dips. 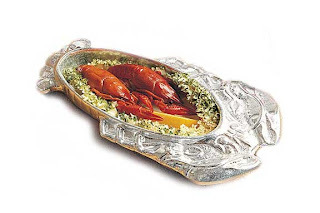 Serve it in this oven safe pewter crawfish casserole dish with crackers or in individual pastry cups. In a large skillet, melt the butter over medium-high heat. Add the green onions and garlic and cook, stirring, until soft, about 3 minutes. Add the flour and stir until caramel colored (this is making a roux) approximately 2 minutes. Add the tomato paste and stir for 1 minute. Add the cream, brandy, lemon juice, salt and cayenne. Whisk to combine. Cook, stirring, until the sauce thickens, 3 to 4 minutes. Add the crawfish tails and cook until warmed through, 2 to 3 minutes. Remove from the heat and adjust the seasoning, to taste. This recipe adapted from Emeril Lagasse. Here are more blog posts with recipes for Crawfish Phyllo Triangles Appetizer and Tony Chachere's Shrimp and Crawfish Fettuccine. Looking for more links on how to eat crawfish? Click here. 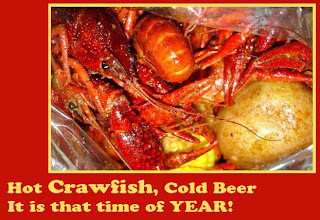 Either way you enjoy crawfish this season, just slow down and let the good times boil!